Sixty years ago, the University of Chicago Press undertook a momentous project: a new translation of the Greek tragedies that would be the ultimate resource for teachers, students, and readers. They succeeded. Under the expert management of eminent classicists David Grene and Richmond Lattimore, those translations combined accuracy, poetic immediacy, and clarity of presentation to render the surviving masterpieces of Aeschylus, Sophocles, and Euripides in an English so lively and compelling that they remain the standard translations. Today, Chicago is taking pains to ensure that our Greek tragedies remain the leading English-language versions throughout the twenty-first century. In this highly anticipated third edition, Mark Griffith and Glenn W. Most have carefully updated the translations to bring them even closer to the ancient Greek while retaining the vibrancy for which our English versions are famous. 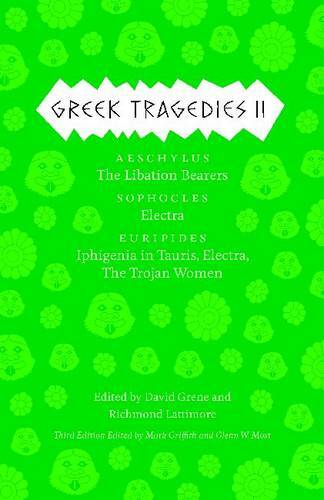 This edition also includes brand-new translations of Euripides' "Medea", "The Children of Heracles", "Andromache", and "Iphigenia among the Taurians", fragments of lost plays by Aeschylus, and the surviving portion of Sophocles' satyr-drama "The Trackers". New introductions for each play offer essential information about its first production, plot, and reception in antiquity and beyond. In addition, each volume includes an introduction to the life and work of its tragedian, as well as notes addressing textual uncertainties and a glossary of names and places mentioned in the plays. In addition to the new content, the volumes have been reorganized both within and between volumes to reflect the most up-to-date scholarship on the order in which the plays were originally written. The result is a set of handsome paperbacks destined to introduce new generations of readers to these foundational works of Western drama, art, and life.